The pace of consolidation within the contact centre market has increased in recent years, as providers seek efficiencies of scale that make the most of investments in new technologies. This trend is expected to continue, and the market continues to see M&A transactions. In the past, UK-based businesses have often been acquirers, but also represent attractive targets for overseas buyers. Evidence indicates that many deals are happening at the top end of the sector, with smaller players also attracting some attention. October 2017: Serenova (US) completes acquisition of TelStra for undisclosed amount. October 2017: Sonus Networks Inc completes merger with Genband, now renamed as Ribbon Communications Inc.
September 2017: Mitel successfully bids for ShoreTel, acquiring 100% of outstanding shares of common stock to the value of $530m. July 2017: Sabio acquires DatapointEurope, creating combined revenue business of £60 million. March 2017: Sabio acquires UK peer, Rapport, for undisclosed sum. December 2016: Solar Communications buys UK peer, Denwa, for undisclosed sum. December 2016: Mitel (US) sells mobile arm, to focus on unified communications sector. November 2016: Nice Systems (Israel) completes $940m acquisition of inContact (US). October 2016: Webhelp buys France’s Netino ,for undisclosed sum. August 2016: Genesys (US) agrees to $1.4bn purchase of Interactive Intelligence Group. August 2016: KKR agrees to purchase Calabrio (US), for undisclosed sum. January 2016: TSYS (US) announces $2.35bn deal to buy TransFirst (US). January 2016: Business Growth Fund invests £15.3m in UK’s Olive Communications. November 2015: KKR buys controlling stake in France’s Webhelp from Charterhouse Capital Partners, for undisclosed sum. 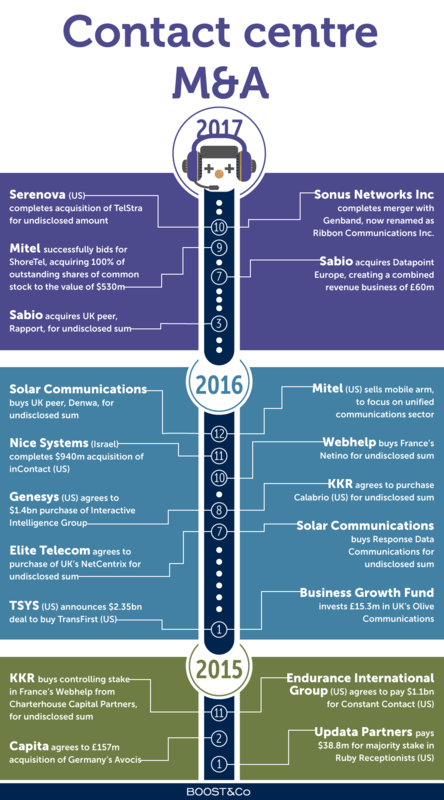 November 2015: Endurance International Group (US) agrees to pay $1.1bn for Constant Contact (US). February 2015: Capita agrees to £157m acquisition of Germany’s Avocis. January 2015: Updata Partners pays $38.8m for majority stake in Ruby Receptionists of the US.